This is what fast food should look like. Full of flavour (the feta) and nutrients (the rapini) and made in a single pot in under 10 minutes (calculated from the time the water boils). The salty feta melts into the pasta and is the perfect creamy complement to slightly bitter rapini. I am going to try mixing the leftovers with a bit of vinaigrette for a lunch-time salad. 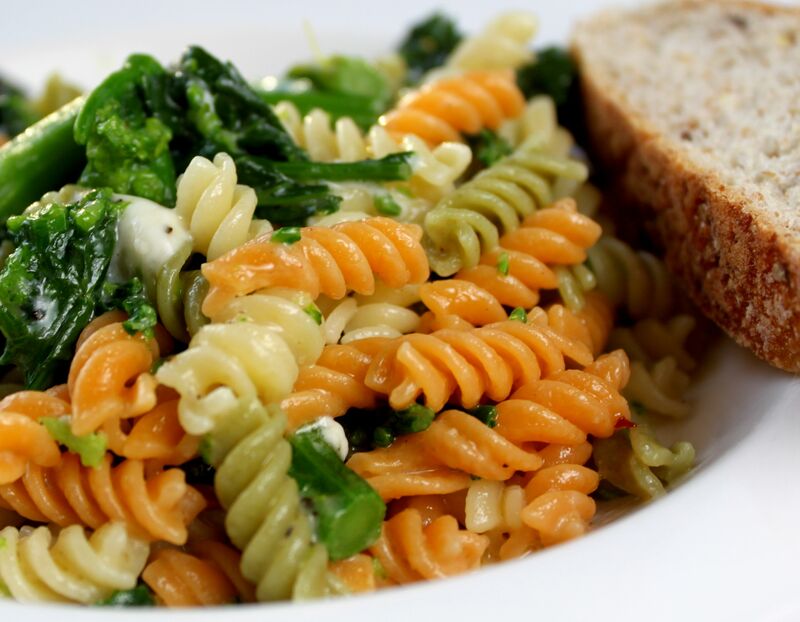 I used vegetable fusilli for this (to sneak a little bit of spinach into the kids) but any kind of pasta would do as long as there is a enough texture to hold of the feta. In a large pot, boil well-salted water for pasta. While the water is heating, trim the bottom half-inch or so off the rapini and roughly chop. Set aside. Crumble the feta and set aside. When the water is at a rolling boil cook the pasta for 5 minutes, add the rapini and cook for another two minutes or, until the pasta is al dente. Drain the pasta/rapini, retaining a little of the water, return to the pot and add olive oil, pepper and crushed chili flakes. Taste before salting. Add a little of the cooking water if it is too dry. This entry was posted in Pasta and Noodles, Sides, Vegetables. Bookmark the permalink.